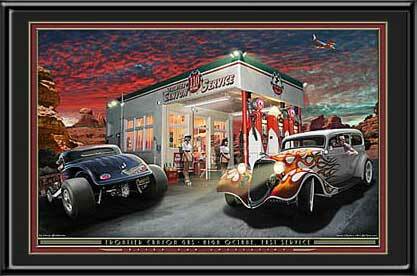 A 3 window Blown Ford Coupe and a '32 "chopped and channeled" two door Ford Sedan sit in front of this illustrated 50's era filling station. Picture Lighting Effects: Mini Light Bulbs in car headlights. Red & Yellow L.E.D.s light up tail lights, bldg & Stars in sky.